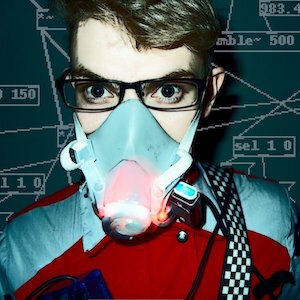 Dan Wilcox is an artist, engineer, musician, performer who combines live musical performance techniques with experimental electronics and software for the exploration of new expression, often through themes of science fiction, space travel, cyborgification, and far futurism. His father was an aerospace engineer, he grew up in the Rocket City, and has performed in Europe and around the US with his one-man band cyborg performance project, robotcowboy. Dan currently lives in Karlsruhe, Germany and is an artist & researcher for the ZKM | Hertz-Lab. I make technically complicated projects for noisy/primal displays with the air of a self-serious technician telling an inside joke. Due to my background, my work is a constant tug of war between utopic engineering perfection and the wants/needs of our literally squishy existence. I enjoy creating performative systems which both project a complete ideal yet contain an integral aspect of chaos, from the computer vision translation of my slippery mouth to performing in a cyborg system that can crash at any moment. That moment is part of the show, a break from expectation and the destruction of an ideal that may not be reachable, like a monkey opening a coconut with an iPad. To quote Devo: "We live in a wiggly world."